COACHELLA organizers are offering $10,000 and four (4) festival tickets for life in exchange for the safe return of the two-story inflatable pig that broke loose during Roger Waters' set on the final night (Sunday, April 27) of the 2008 COACHELLA VALLEY MUSIC & ARTS FESTIVAL. The pig escaped and floated into the desert sky just prior to the intermission between Roger Waters' back-to-back sets--marking the only back-to-back COACHELLA sets by one artist in the critically acclaimed festival's history. It's only grainy cell phone video, but I'll take what I can get. At the end of Rogers Waters' set at Coachella this weekend, he unleashed the trademark flying pig over the crowd. This time, the hovering swine bore (boar?) a political message.......the bottom of it simply read "Obama" with a checked box next to it. Full story here. Prince's set Saturday night at the Coachella Valley Music Festival sounds like it was a classic. Along with plenty of his classics, he delivered a cover of Radiohead's "Creep".....let's all collectively pray that someone got it on video. The set also featured guest spots from Morris Day, Sheila E, and a cover of the Beatles' "Come Together". Full Report here. An 8 year old girl from Chicago is pulling out all the stops to commemorate her Holy Communion. In addition to ample quantities of Mexican food, she's also hoping to have multi-platinum recording artist Kanye West drop by. 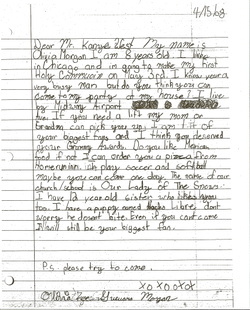 To that end, Olivia Morgan wrote Kanye a letter. The only problem is she can't seem to track down his address. Here at The Ghost we're always glad to put our unsubstantial weight behind a good cause, so with that in mind, here is Olivia's letter (address redacted). "Dear Mr. Kanye West. My name is Olivia Morgan I am 8 years old. I live in Chicago and I'm going to make my first holy communion on may 3rd. I know your a very busy man but do you think you can come to my party at my house? I live by midway airport at [......] Ave. If you need a lift my mom or my Grandma can pick you up. I am 1 of your biggest fans and i think you deserved your Grammy Awards. Do you like Mexican food if not I can order you a pizza from Home Run Inn. I play soccer and softball maybe you can come one day. The name of our church/school is Our Lady of the Snows. I have 12 year old sister who likes you too. I have a puppy named Nacho Libre don't worry he doesn't bite. Even if you can't come I will still be your biggest fan. xoxooxox Olivia Zoe Guevera Morgan p.s. please try to come"
Chicago's own version of "Chinese Democracy", the long awaited reincarnation of the Bottom Lounge, has been put off yet again. As of today the Pegboy show slated to be the venue's first has been cancelled, and another has been moved. Earth, slated for April 25th, will now be playing at The Note, and Femme Fatality has been moved from The Note to South Union Arts. I first saw Montreal's Plants and Animals at the Iceland Airwaves Festival last fall and had my proverbial socks thoroughly knocked off. Since then their full length debut has been released, and it is every bit as good as I hoped it would be. Critics seem to have a tough time putting a label on them, and that's largely because their songs are so diverse. Such diversity tends to be frowned upon by industry types because its tough to market, but in this case it is a massive, glowing positive. The band might stir up cathartic emotion with Arcade Fire-ish choruses at one moment, and the next could be nailing a percussive African guitar riff, but the common thread is that they never forget to revolve their musings around strong melodies and well constructed songs. From time to time you will see the "jam band" tag added to the description, which couldn't be further from reality. The band, all music school grads, knows their way around their instruments and certainly doesn't mind letting you know that, but it never veers into self-indulgence. 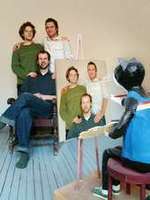 Their live show is one of the more unique and well-executed offerings I've seen, and I strongly recommend anyone with a couple spare hours Thursday night drop by Schubas and check it out. Meanwhile, take a listen to "Bye Bye Bye" the opening track off of Parc Avenue, which was released in the US last week on Secret City Records. In this age of glossed over PR releases and highly controlled communications, there is something remarkably enjoyable about watching a very public self-destruction. While it may not be Britney-esque just yet, the acrimonious breakup of singer Scott Weiland with his band Velvet Revolver has some serious potential. After essentially quitting on stage a couple weeks ago, a bout of squawking press releases has followed, and they just keep getting better. According to the Huffington Post Slash was quoted as saying "This band is all about its fans and its music, and Scott Weiland isn't 100% committed to either. Among other things, his increasingly erratic on-stage behavior and personal problems have forced us to move on." 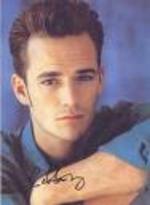 Weiland immediately shot back, "The truth of the matter is that the band had not gotten along on multiple levels for some time.... I choose to look forward to the future and performing with a group of friends I have known my entire life, people who have always had my back. This also speaks to my commitment to my music and my fellow band mates in [Stone Temple Pilots] and to the fans who I feel would much rather watch a group of musicians who enjoy being together as opposed to a handful of discontents who at one time used to call themselves a gang." The Chicago Tribune's Greg Kot is reporting that Death Cab For Cutie will be playing the Pritzker Pavilion at Millennium Park on June 3rd. Tickets are reportedly going on sale on April 19th for $45 or $10 for lawn. Death Cab will add to the small list of rock bands who have played the city's crown jewel, including Wilco and The Decemberists.